Why not prepare some Mexican Toast or Tostadas Mexicanas to your dinner? Why not prepare some Mexican Toast or Tostadas Mexicanas for your dinner? 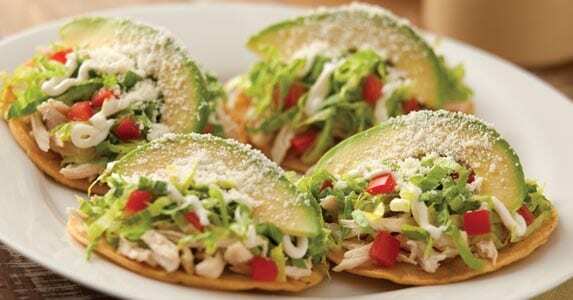 Tostadas are typical in Mexico, but how to they look like? Tostadas are like flat tacos that are usually made by layering refried beans (frijoles) on top of a fried, flat corn tortilla. Make sure to add several toppings, like lettuce, guacamole, cheese and salsa. Add even meat or chicken to your Mexican Toast if you are really hungry. Like most Mexican food, they are colorful and tasty. They are festive, but best of all, they are easy to make and perfect for a casual spring or summer Mexican dinner or lunch buffet. They look delicious and they are healthy and yummy! Avocado has good effects for aesthetics, preventing the aging of the skin and protecting your hair, so you can have it among the allies to look much more beautiful and young. You can apply it as without a mask on the face, to improve sunburn injuries and also to reduce wrinkles. Thanks to its creamy consistency it can be used as a replacement for butter or mayonnaise. It is a good idea to make cakes, banana bread, brownies, sandwiches, toast for the snacks, dressing salads, etc. In traditional medicine several properties are applied to avocados, especially aphrodisiac and antidiarrheal. Seeds, leaves and even bark are used for these cases. But not only for these two goals, but also to relieve dysentery and prevent baldness. Rabat in Morocco will get tram this year!